From which end should I start? How many days to ride the entire trail? Where can I camp along the trail? Is water available along the trail? Is food available along the trail? What kind of bike tires should I use? Can I rent a bicycle? Any tips for Scout leaders? This section contains the beautiful Monocacy Aqueduct, a 500 foot, seven arch, stone bridge used to carry the canal over the Monocacy River. The aqueduct took 4 years to build and was completed in 1833. Next to the tunnel at Paw-Paw (mile 155), is this probably the second most impressive structure on the canal. In the 1970s, the Park service erected temporary exo-skeleton supports around the aqueduct due to damage caused by repeated flooding. In 2005, aqueduct repairs were finally completed, and so the exo-skeleton has been removed. The only other point of interest that you "might" see in this section is the Dickerson power plant (mile 41). In 1992, a training course was built in the power plant's warm water discharge spillway for the US Olympic Kayak Team. You might be able to see it through the chain-link gate at the south side of the complex. Trail conditions are historically poor in the mile or two prior to the town of Point-of-Rocks, Maryland. Expect to navigate around many mud holes in this section. The rest of the path is typically in good shape. 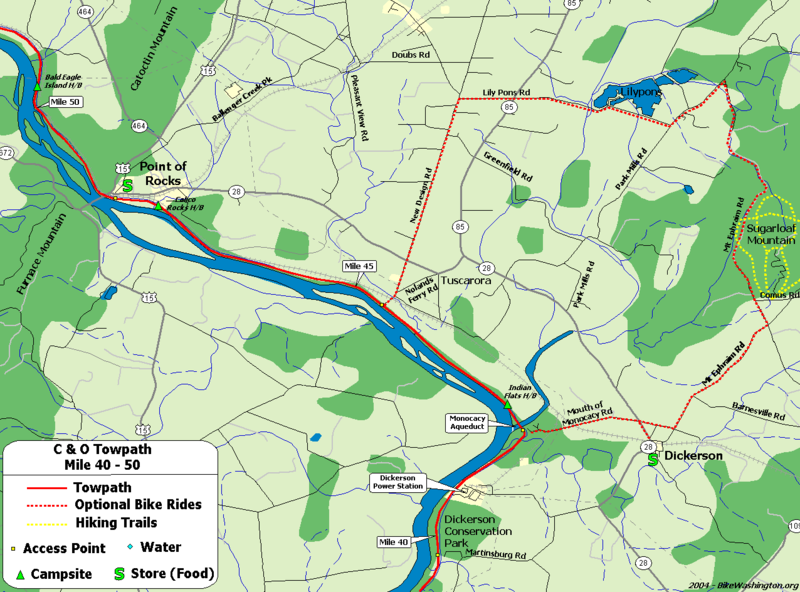 Connecting Rides: Here are some short rides that make use of the towpath along this section. Access to the town of Point-of-Rocks is by way of a small, wooden, one-lane bridge over the canal bed. This town is a good lunch/re-supply stop as there is a deli's about a block off the towpath. Also, be sure to roll down to the beautiful Point-of-Rocks railroad station, one of the most photographed stations in Maryland. There is also a small strip mall a bit further past the railroad station that contains a pizza shop and deli. Just after the wooden bridge, the C&O Canal passes through the Catoctin Mountain Range. During the canal construction, the B&O Railroad mounted an unsuccessful legal challenge for the narrow right-of-way through this pass. As a result, the railroad was forced to tunnel through the mountain. After the canal failed, the railroad built a second track in the abandoned canal bed. However, the towpath is still intact through the pass. Point-of-Rocks also hosts one of the Potomac River gages. You can check the current river height over at Weather.gov. The flood stage at this location is 16 ft, but the towpath is generally not affected until the river reaches 22 ft. The record at this location was 41 ft during the 1936 flood. 42.1: Monocacy Aqueduct - make left turn onto Mouth of Monocacy Rd (about 1 mile past Dickerson, MD). 44.6: Nolands Ferry - (near Tuscarora, MD). Easy access from Route 28 via Noland Road or New Design Road. 48.2: Point of Rocks, MD - located right on the north side of the Potomac River Bridge, at the intersection with Route 28. After turning off Route 15, make immediate right turn and follow short road behind homes to the canal. 41.6 Dickerson Power Plant US Olympic Kayak Team trains in spillway next to towpath.